This place is oddly difficult to capture in words. Though it has more charm than the average “Pueblo Mágico,” to write solely about that would be to overlook a major element of the place too. In fact, it would be rather crass in my view. On the surface, the town is lovely. As I drove into town, I was enchanted by the colonial street layout and charming old buildings. 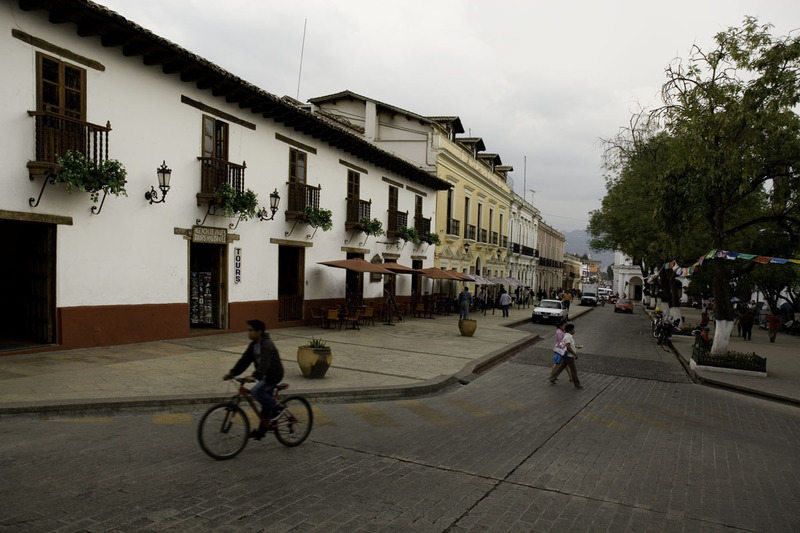 Unlike places such as Puebla or Mérida, the structures here are simpler, shorter, and mostly have sloping, tiled roofs. 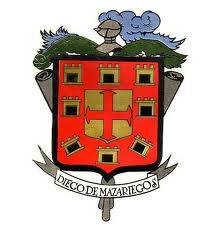 The look is a bit like a multi-colored Pátzcuaro, which unlike here, has a uniform color code for all the buildings. Here, colors run riot in a more typically Mexican fashion. There’s also more variation in building style than you’d see in Pátzcuaro. The climate too was literally a breath of fresh air. After the heat and humidity of the Yucatán and Palenque, it was nice to be at 2,200 meters of altitude, or about 6,800 feet. I quickly found a hotel, unpacked, and began strolling around the town. It’s hard to be here without thinking about culture. The place is such a mix of them. Of course, there’s the obvious, the national Mexican culture. This place is a PRI stronghold, and as Mexican as anywhere in this country, with plenty of tacos and tequila available. But it’s also one of those places that has been molded by the fact that it relies so heavily on tourism. 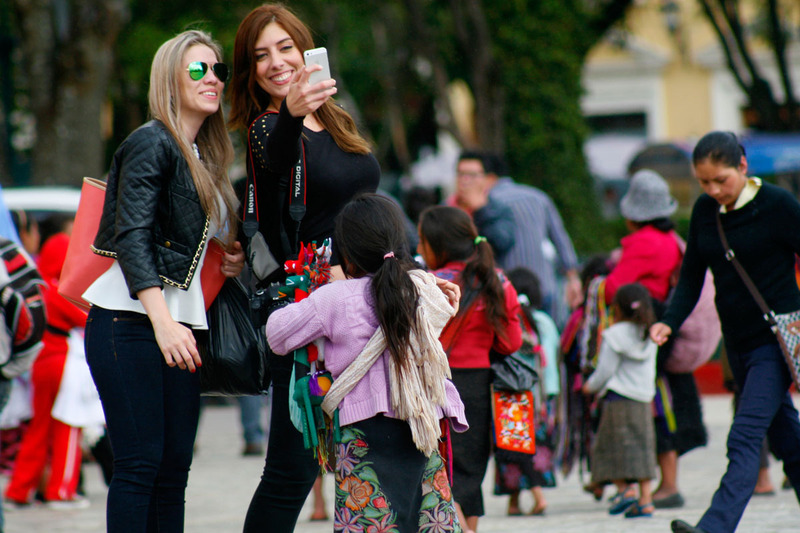 Most of the tourists are Mexican, probably from Mexico City, or one of the other northern mega-cities. But there are also lots of Europeans. Strolling the streets I hear a lot of French, some German, a sprinkling of Spanish from Spain, and some Nordic-sounding languages. There’s surprisingly little English, either of the US or the British sort, though you can hear it from time to time. And there are hippies. There are LOTS of hippies. Again, mostly European hippies, old-school (though not old) hippies, with long hair, grubby-but-kinda-cool clothes accented with indigenous textiles, sandals, and small children with untamed locks. Most of them appear to live here. They’re not snapping pictures, and they have a settled-in look. I even saw one peddling pizza by the slice in the plaza. They also appear to have created a number of cafes and restaurants. And thanks to the hippies (in all probability) there are vegetarian restaurants, even vegan ones, something this gringo greeted with gusto. But to me, the most interesting cultures here are the indigenous ones. Of course there are a maybe a dozen or so distinct indigenous cultures in and around San Cristóbal, each with its own customs and languages, with some curious mixing along the way. For example the other day, I was in the main plaza, and bought some mints from a couple of young, teenaged boys. They were huddled around a smartphone chatting animatedly. When I bought the mints, I asked, “What language are you speaking?” as it was clear that it wasn’t Spanish. “Tzotzil,” one of them replied, as they went back to their smartphone, my transaction complete. Curious, I sat down on a bench next to them, pretending to fiddle with my own cell phone, and eavesdropped a bit. Even though I had no clue as to what they were discussing, the conversation was fascinating. The sound of Tzotzil is, not surprisingly, unlike any European tongue. Nor does it seem to be tonal like an Asian language. The boys were looking at Facebook on the phone and chatting animatedly. But they weren’t speaking pure Tzotzil. There was a smattering of Spanish dropped in every couple of sentences. “guapo,” “diez,” “amor,” (“handsome,” “ten,” “love”) were some of the words I picked up in this conversation. Which, of course, made me even more curious about what they were discussing. Does the Tzotzil language lack words to describe a “perfect ten?” The whole conversation reminded me of conversations in Joanna’s household; just use whatever word comes to mind, never mind the language. I have to confess that I am fascinated by the indigenous people here in San Cristóbal. As I wander the plaza, in my mind I see Mayan princes and princesses, heirs to a once-amazing culture. These people’s forefathers conquered the jungle, built the pyramids, developed the calendar, invented a form of writing, astronomy, and created beautiful art. And despite the crushing imposition of the Spanish conquest, these people have clung tenaciously to their own culture in many ways. The women, at least, wear traditional clothing which identifies their village and tribe. Often this “uniform” consists of a black goat-skin skirt, which still has the goat fur on it. Then a colorful blouse, a sash, a sweater or rebozo. The women typically wear their hair either in braids or put up. The men, oddly, seem to dress like any Mexican man — levis, plaid shirts, jackets, boots. The only obviously indigenous thing about them is their sharp features and bronze skin. Once in a while you’ll see a guy in indigenous garb, but the women are more faithful. They are short folks too. The adults here seem to run about five feet tall in stature, short even by Mexican standards. Most of the time I found myself towering over the crowds. As I stroll the plazas and watch these people pass by, I’m really challenged by mixed emotions. Despite a long-ago, glorious past many are now peddlers in the town square, scratching out a living selling tourist trinkets that they worked hard to produce by hand. The poverty of these folks is sad and disturbing. 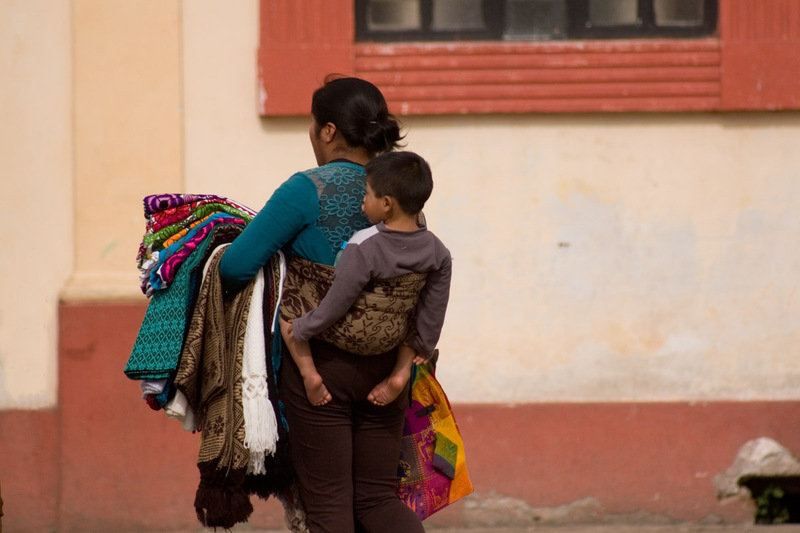 According to Wikipedia, about 75% of residents of the state of Chiapas live below the Mexican poverty line. And I can see it in the dirty five-year-olds selling boxes of Chiclets for a peso a piece. I can see it in the hardened faces of the young men, struggling to support their families of five, as they lug heavy burdens up and down stairs of the market. 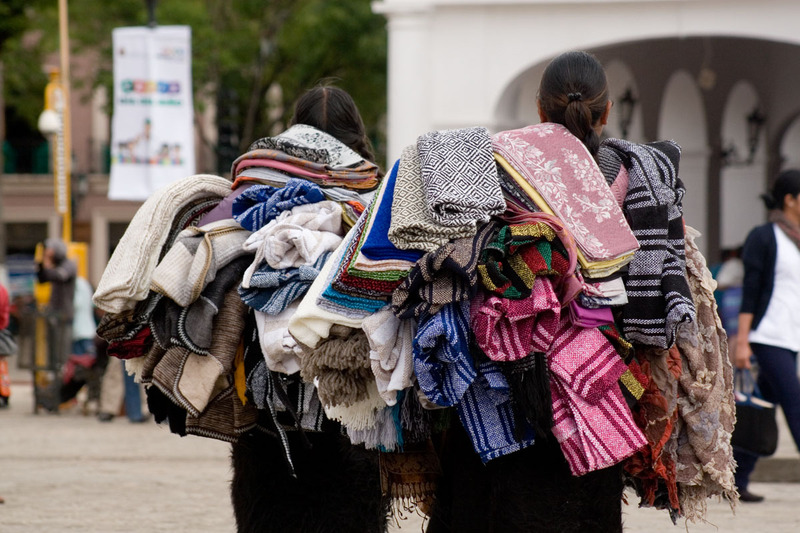 I can see it in the women in the plazas, weighed down like burros with kilos and kilos of blankets, rebozos, belts, bracelets and other things for sale to us tourists. The predominant vendors of cigarettes, gum, mints and candy in the squares are preadolescent boys who should be in school. Five-year-olds are trying to persuade me to let them shine my shoes. I look at them, and I see my own little nephew and shudder. Now it’s easy for me to drive in on my ten-week vacation and breezily identify the problem. The causes, of course, are myriad and complex. Some of them date back to the conquest. Some of them are of course more recent. Land inequality is a big issue, one which the Zapatistas have been trying to address. Sadly, mostly without success. Education is also a big issue. Very young children are put to work selling stuff all day long, losing the opportunity to develop better skills. And some of the causes of the poverty are inherently cultural to the groups themselves. Who seriously should start a family in their late teens with no income, no assets, no education, and no prospects? Yet Southern Mexico isn’t the only place where this cycle feeds upon itself. Sadly, it seems to be part of the human condition. But it’s really visible here, and unless you’re traveling in a coma, it’s got to give you pause. Wednesday was Día del Niño in Mexico, day of the child. Here, this is often celebrated with either a more relaxed, “fun” day at school—sharing food, playing games, listening to music— or a school holiday. Often there are special activities for kids in parks and sports centers, and it’s also sometimes a day where kids get gifts. In San Cristóbal, the schools closed, and the city or state put on a bit of a party in the Plaza de la Paz in front of the cathedral. There was music, entertainment, and some kinds of games. But there were also handouts — toys for the kids like blonde Barbies, and play makeup sets for the girls, and plastic cop cars and farm animals for the boys. There were also packages of food assistance for the families. These were boxes about 12” on a side, a cubic foot, which presumably contained staples such as beans, corn, aseptic milk perhaps, and a few other things. It wasn’t much, but seemed to be appreciated and was eagerly snapped up. The kids, of course, were ecstatic at their new toys. But I watched this all with certain feeling of sadness that so many people clearly needed these gifts and this help. The lines were enormous, hundreds and hundreds of people deep. They snaked across the plaza, doubled back, and ran around the municipal palace. I’d imagine that the families probably had to wait in line for hours to get their handouts. And though I didn’t do a formal survey, I did not see a single güero face in line. Yet all the festivities were in Spanish. Now I’m not advocating linguistic isolation; it’s important that the kids learn Spanish. But it would have been nice to see some indigenous culture thrown into the mix. As for the gifts and food support, it’s terrific that the government can help out these families, but again sad that they need it so badly. And not to make this a totally depressing post, but I can only imagine that the poverty and want in the surrounding villages is much worse. So for me, San Cristóbal has been a place of mixed emotions. Despite the obvious poverty, the town has an odd attraction. Though there are lots of restaurants and cafes, many with music, there’s really not much else. Yet the streets and the vibe are somehow compelling. It could be an interesting place to live. Without a doubt, it’d be a cheap place to live. I ran into an American couple last night from Texas. As I passed by a falafel place and paused to look at the menu, they beckoned me in. “This is good,” I could see on their faces. After I settled in, I asked if they were American, and we started chatting. It turns out that they have lived here on and off for about eighteen months, and have a one-bedroom apartment not far from the main plaza for which they pay the princely sum of $265 USD per month. They use little gas, and little heat. Food here is noticeably cheaper than other parts of Mexico, and other services also seem cheaper. I also think that’s part of the reason there are so many hippies. Where else could you live in such an interesting place for maybe as little as USD $1,000 per month if you were very careful? I’m ready to move on, though with mixed emotions. I’d actually like to stay longer here; the place has an odd magnetism. But I am sadly starting to see the end of my journey. I need to be back in Boston by the end of May, a little less than a month from now. I’m figuring on about 2 weeks of driving days, so that leaves me about two weeks of adventure days left. I’m also eager to get back to Puebla to see Edgar, something he’s eager for too. Someday I hope I can come back here to San Cristóbal, but for now, it looks like adios. Note: if you are concerned by appearing in a photo in this blog post, please leave me a comment indicating such, and ALSO an e-mail stating which photo, and I will attempt to blur your facial features or otherwise accommodate your request in a timely manner. You need not identify which photo in the comment, and I will delete any such comment to preserve your anonymity. If you have never left a comment before, the comment will only be visible to me, and thus will never appear in public. Your post captured the same sentiments I had while staying there for a month long stint. I really appreciate the article and how you describe everything. Hola Sheena! Thanks for the kind comment. I’m glad you liked the post. May you have many more tremendous adventures. Saludos and thanks for stopping by! Future comments (with same email, etc) will be automatically approved. I spent days in SCDLC and I can say with certainty it is the most curious mixture of peoples I have ever experienced. I am planning to retire there. I fell in love with the Town. Simple as that. Hola Bruce! Thanks for your comment. Yes, San Cristóbal is a marvelous place, isn’t it? I wish you well. Saludos. I am sitting in a cafe in Cusco experiencing many of the emotions you describe, for the same reasons. Thanks for the honest post about San Cristobal. About the birth rate, you find that where there is poverty. Having a child is many things for poor people, I think the most important being that you CAN have it. It is creation, it is love, and it is yours. This, mixed with the ignorance spewed by the Catholic Church probably accounts for most of the over-population in Latin America. Hola Vellissima! Indeed, having too many children (or, worse, too soon) definitely exacerbates poverty as it limits parents’ earnings potential just when they need more money the most. Thanks for your comment, and note that future comments won’t be moderated. Saludos and thanks for stopping by! HI, thank you for writing so warmly about my favorite city! 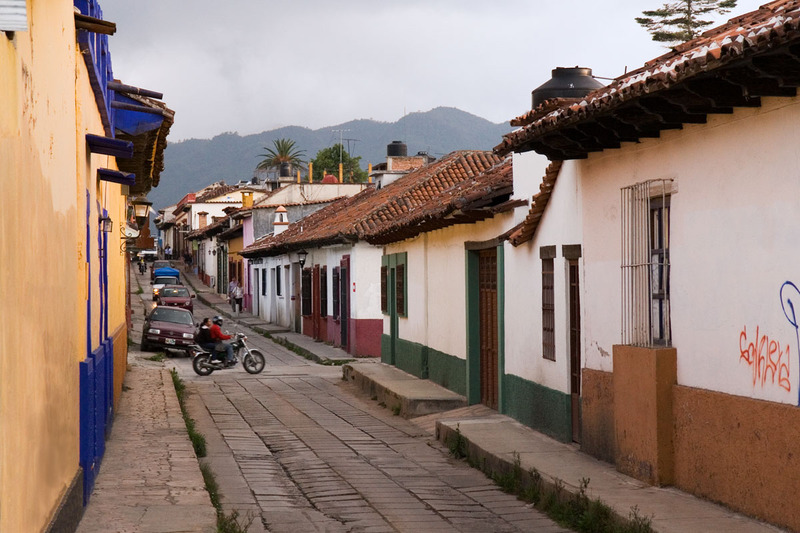 I lived in San Cristobal for 3 years, beginning just before the Zapatista revolution. I love the city still, although it has grown and changed. We are planning to stay there this summer (2015) for 3 weeks and would like to rent a small 2 bedroom house. Does anyone know of a reliable, safe source for a low-cost rental? We are planning to move to San Cristobal in 2 years, and so we’re scoping out the rental possibilities now. Hola Peggy! Thanks for stopping by and commenting. Future comments will appear right away. I wish I could help you with a rental, but I can’t. Hopefully someone else might. That said, there are plenty of hotels in San Cristóbal which could provide a handy base from which to seek a better place to stay. Buena Suerte y Saludos! 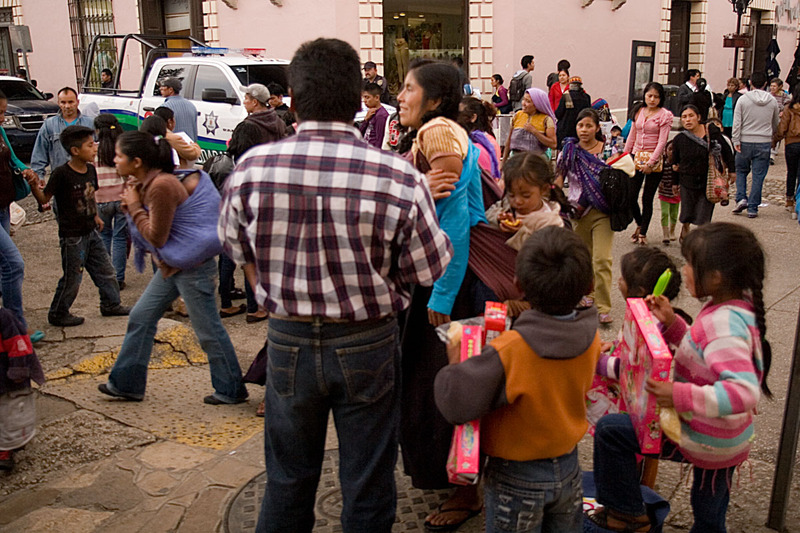 Pingback: Niños migrantes, víctimas de trata; centroamericanos sufren amenazas. I am going to put all of your trip to Mexico on a word document so I can read it again from beginning to end. I have soooo enjoyed going along for the ride!!! Thanks, Cat! That’s a very kind comment. And believe me, the blog is only a small slice of what, for me, has been an amazing trip. Saludos! You mention a learning curve when it comes to long-haul trips. Now I’m curious about what you learned. What do you wish you packed, and what should you have left at home? Perhaps a post for another day, or an epilogue when you’ve completed this incredible journey. Hola Lee! I am planning a post on the topic in the future. But I forgot a few things. Other things, like my large ice chest, I haven’t really used because it requires more than a standard bag of ice. And the small ice chest will only hold about a quarter of a standard bag of ice. I brought too many clothes. I’ve hauled the same thing up and down hotel stairs without using them. Oh, and also, I can only drive so far in a day before I start to pay for it the next day. Stuff like that is some of what I’ve learned. Saludos! As you are finding out, five weeks is not enough time to visit the area you have chosen. Ten weeks in not enough either but I support your thoughts on flying home to take care of business and then returning to complete your adventure. I am slow to the comment party because I wanted time to digest your very articulate impressions of San Cristobal de Los Casas. Your feelings are very much like my own. We left the motorhome behind and drove the Honda from Villahermosa, staying in a hotel for three nights. We left early in the morning so we could complete each direction in one day, we learned long ago to never drive unfamiliar Mexican roads at night. It was the middle of January and the difference between the humid heat of Villahermosa and the cold, rainy highlands left me with a bad cold that actually kept me in bed one whole day. The EZLN (Zapatistas) are alive and well in San Cristobal and I actually have a great deal of sympathy for their demands for agrarian reform. Severe poverty should not exist in such a lush growing environment. Like you, we noticed the number of Europeans visiting or living in the city. It was unlike anything we had seen in Mexico. It is a city I would love to return to. Hey Croft! I’m happy to have your comments whenever you feel like leaving them, so no worries there. New comments show up at the top of my comments panel anyway, so it’s not like it’s hard for me to find them. And I totally agree with you about driving at night. Even on a cuota, it’s risky. I’m here in Córdoba, Veracruz and had a very very nice dinner and evening because it got dark, and I didn’t want to risk hitting a pothole at 60 MPH. So fate dropped me here, where I otherwise would not have stopped, and I’ve had a nice experience out of it. And yes, something needs to happen in San Cristóbal to improve the lot of the indigenous people, whether that be land reform, more compulsory education, family planning, whatever. It’s gotta happen. Thanks for the kind words, and saludos! P.S. I had planned this trip at approximately ten weeks, but I now see that I could easily spend three months or more doing it. But this is my first really long trip of any kind, and I can now see that there’s a learning curve. Next time, there are things I’ll bring and other things that I’ll leave behind. I should have asked your advice before I left, actually. Oh well. Saludos. There is very good coffee available from the roadside stands in Cordoba. If you are a coffee drinker you should stock up with a couple of pounds. Hey Croft! I bought a kilo of dark roasted beans in Córdoba at a place called Calufe that also has branches in Quéretaro, DF, Orizaba, and Guadlajara. The coffee is very good and at 220 MXN for a kilo, a good value. Saludos! Hey Kim you appear to be close to us. Woke up to 59 F inside this morning – coming from 6 months of seldom below 70 F and mostly closer to 80 F on average – well we are freezing! (I know Steve likes the cold – anything below 67 F is suffering for us). In any case maybe we will see you even though Puebla beckons to you apparently 😉 Xalapa is more than 1/2 million. Safe travels amigo! Hola John! Indeed, I am near you, at least relatively speaking, here in Córdoba, Veracruz. I’m going to head to Tehuacán today, and then spend a bit of time there. I’ll e-mail you, and we can align our schedules. I’m still eager to meet you and Anita. Saludos and stay warm! Hi Kim, I seem to remember mentioning that once you have finished this trip, you’ll never look at our world in quite the same way – ever again. 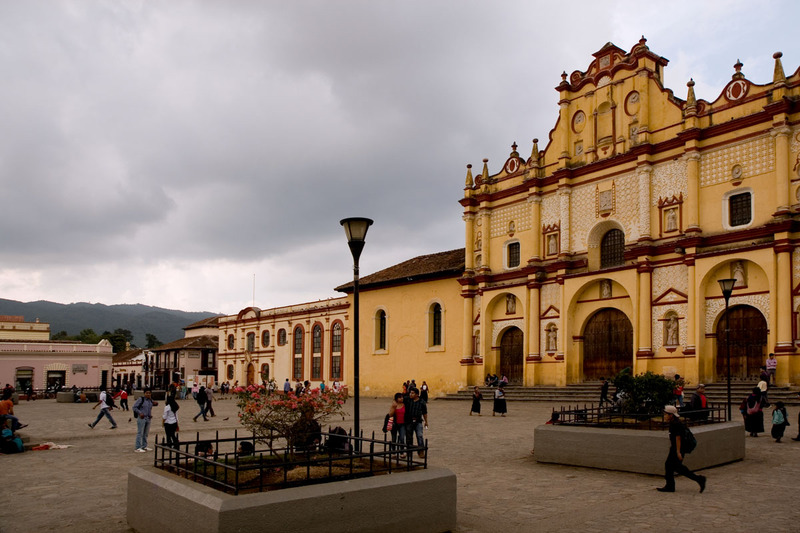 This post is evidence that your attitudes are already shifting… Spending several days in San Cristobal de las Casas takes the mind and the heart into new territory, doesn’t it? I have visited Chiapas about 50 times, and every visit has been a surprise. My increased understanding of the place and the people, makes me aware of how much I have yet to learn. Hi Joanna! You are absolutely right. Being at the Día del Niño celebration was almost painful. While I seemed to be the only person who felt that way, I couldn’t escape the feeling. I felt so sorry for those families who had to work so hard to have so little. And the fact that none of the songs were in Tzotzil or any other indigenous language also bothered me. Having a bit of indigenous culture thrown in would have been good for everyone — mainstream Mexicans, indigenous people, heck even the tourists. And seeing beautiful indigenous girls with their blonde barbies was also hard. It made me feel the same as I did in Zacatecas at the clown show, where small girls were being indoctrinated that Moreno is bad, ugly, and undesirable. Someone in Mexico needs to start a “Moreno es Guapo” public service campaign. ASAP. Thanks for your thoughtful comment. Saludos. PS. This trip is also making me even more grateful for the good fortune I enjoy in my life. I am really blessed, and this trip is keeping that fact front and center. The indigenous music that I have heard in Chiapas is very mournful. I suppose there must be children’s and livelier folk songs, but in Mexico, parties usually feature loud current pop tunes (in Spanish) or traditional children’s songs by artists like Cri-Cri. “Moreno es Guapo” … I doubt we’ll see this in our lifetime. Again, there are many cultural reasons why not. We should talk about this again some time. And yes, we need to be extremely grateful for the good things we enjoy. It is hard to go to Chiapas, and not leave feeling like this. Driving through those hard-scrapple hamlets, I often wonder what it would be like to grow up in such a place? Hey Joanna! As I noted in the post, I don’t have the answers. As for Tzotzil children’s music, I’m sure some could be commissioned, no? Human creativity is boundless and I’m sure someone could easily create such music. And I agree with you on the prospects for a “Moreno es Guapo” campaign. But it doesn’t mean it’s not a good idea. If I were Carlos Slim, I’d throw some tens of millions at such an idea just to get people thinking. And yes, I too have wondered what my life would be like growing up under such conditions. Pretty grim is my conclusion. Thanks for stopping back and saludos! The trip sounds truly amazing. Thanks for sharing, and glad that it is going so well. Hey Rockdog! The trip is one of the most amazing things I’ve ever done. I’m now wishing I had more time, and had started sooner. Alas, such is life. Thanks for commenting and saludos! 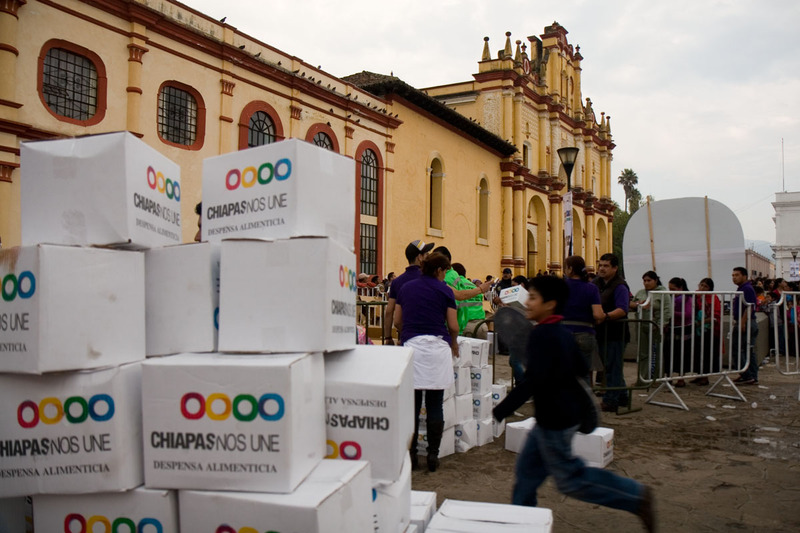 Chiapas is like Guatemala , it is a political boundary between the two, not a cultural one. One comment about the Zapata movement: The squeaky wheel gets the grease, the Federal government has been pouring infrastructure money into Chiapas. Road blocks are a pain but enough of them and the central government opens its wallet. Hola Norm! One of these days I’ll have to get to Guatemala. I just don’t think I’m gonna drive there, LOL. As for the squeaky wheel theory, I’m sure it works, but I have started to wonder if the horrible condition of the highway is because the Zapatistas make it hard to maintain. The sign in the last post said “no to the highway,” which is why I’m wondering that. Thanks for the comment, and saludos! The only place in Guatemala that I hate driving in is the capital, Guatemala City, and even that place has improved 100%. They painted lines on the main streets, put up timer traffic lights, even a few direction signs. If you can drive in Boston, you can drive anywhere. Hey Norm! It’s funny you mention that if you can drive in Boston, you can drive anywhere. I’ve long thought that myself, and in fact have suggested it as a training ground for some friends who were thinking of driving in Mexico. And painting lines and adding traffic lights! I’ll bet that helps. As I was driving through Tuxtla, I had to cross an intersection that was literally the size of a football field, maybe even a bit bigger. And guess what? One, tiny traffic light at the far right corner, no street signs, no limit line, no arrows, nothing. This was the intersection of an eight-lane libramiento and a 6 lane boulevard. ¡Ay Güey! Saludos and thanks for your multiple comments. Beautiful post. You always provide something of beauty, something to ponder, something to research, something that educates, something that causes longing to broaden my horizons, and something that causes me to evolve. Bless you. Hi Barbara! That’s a very nice comment, and I truly appreciate it. I do try to make these posts interesting, and to convey something beyond a mere, “here’s where I went” kind of story. Thanks again for your comments, and Saludos! Great write-up, as usual. 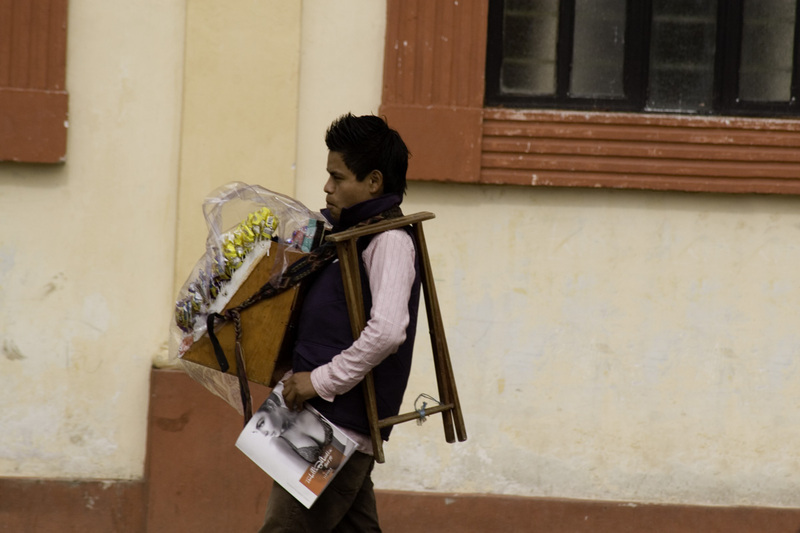 That practice of women toting tons of their wares around the streets on their shoulders like pack mules was something I also saw in Mérida. You do not see it here in Pátzcuaro, however. Thanks for the photos. 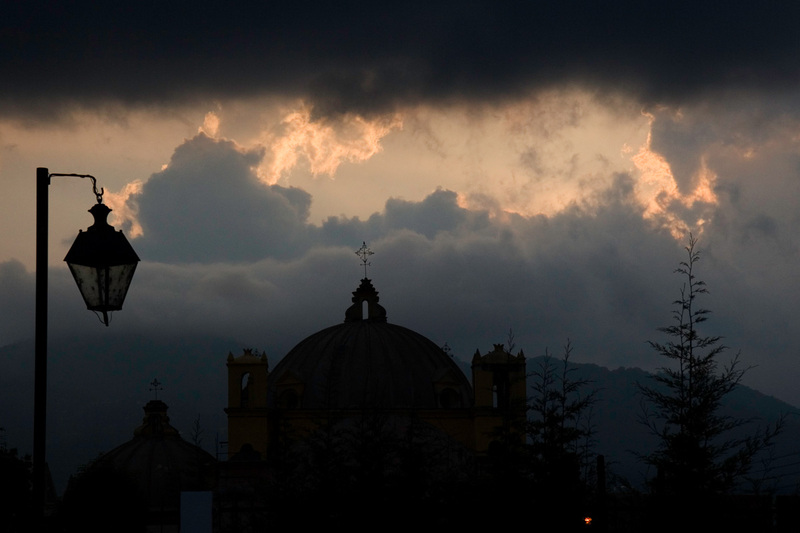 For some reason, I have never bothered to look up photos of San Cristobal. I had no idea. The one-room apartment for $265 is not really all that cheap, depending on the condition of the place. It could even be a bit on the high side. You can find that here where I live, easily. “Who seriously should start a family in their late teens with no income, no assets, no education, and no prospects?” Nobody should, according to you and me, but people all over the world do it regularly. Why do you have to be back in Boston at the end of May? I imagine you have already said why, but I do not recall. Hola Felipe. I have a friend’s wedding to photograph in the first weekend of June, and some niggly annoying stuff like doctor’s appointment, house-related errands, etc. One of the things I’ve learned on this trip is that until you sell your house, you aren’t truly free. Saludos, and thanks for the kind comment. P.S. 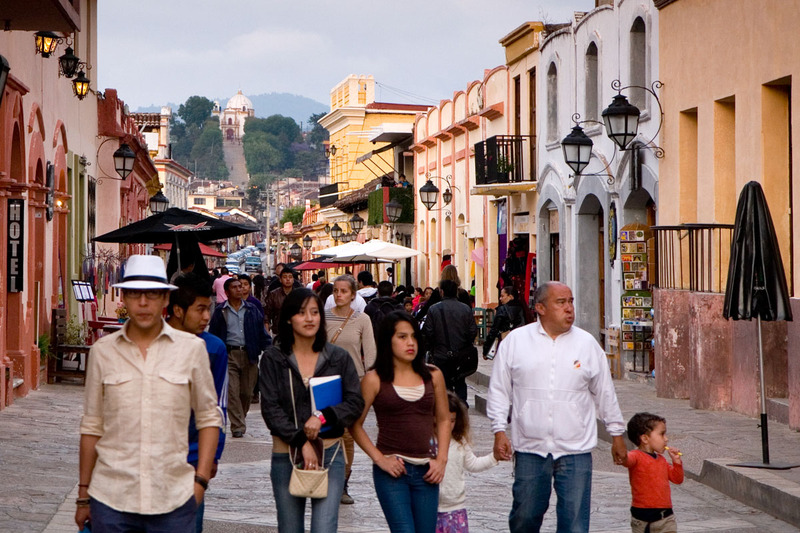 On the apartment cost, keep in mind that San Cristóbal has a population of about 115,000 in the city itself, which is a bit less than 50% greater than Pátzcuaro. (about 80,000) Obviously there are other differences, but it may just be that San Cristóbal is a bigger place. Fascinating! So, I bet you’re already thinking about your next trip, and you’re probably already picking out some places you’d like to stay in for a bit longer…? Hola Simone! Si! I’d actually like to make this trip longer, and am mentally turning over ideas like leaving my car somewhere and flying back, to resume shortly after I’ve done my stuff in Boston. Also, given that I’ve now been in Mexico for five weeks, it’s truly astonishing the amount of stuff I’ve simply driven by because I didn’t have enough time. It’s a really big country. Thanks for your comment, and saludos! Flying back and leaving the car sounds like a great option! And, as far as I understand, like me, you can do your work from anywhere as long as there’s internet. Would be a shame not to capitalise on this freedom. Hey Simone! You are right about me being able to do work anywhere there’s an internet connection. The only problem is, I have to stop sightseeing and actually do it, LOL. So far almost nothing of the kind has happened on this trip. Somehow I thought I’d have more “free time,” but I’ve been busy pretty much the whole trip, either driving, sightseeing, blogging, or resting. I have a stack of unread books with me too, LOL. Saludos! Yes, I agree that San Cristóbal feels more like Guatemala than Mexico. I don’t know, Kim, if you had a chance to visit any of the outlying villages like San Juan Chamula… but there the feeling of being in a completely different world separate from the Mexico that we know is even greater. I was there in the 90s (before the Zapatista uprising), and I don’t know how much has changed since then. At the risk of sounding like a condescending tourist, which I do not mean to be, I felt as if I were in someplace remote, foreign, other-worldly, haunting, and to our Western sensibilities bizarre. It felt as if I had been suddenly plopped someplace like Tibet. Thanks for another compelling post. I hope your drive west out of the highlands is easier than the journey in. Hi Bill! I had very mixed feelings about San Juan Chamula. When I learned that they basically kicked out a bunch of people for conversion to protestantism, I kind of soured on the place. To me, intolerance is intolerance, no matter how colorful and other-worldly, so I decided that I had plenty of other things to see. I may change my mind on that decision some day, but that’s the mindspace I was in when I had the chance. At this very moment, I’m in Córdoba, which is either in Puebla or Veracruz. Thanks for the kind comment, and saludos! I too had mixed feelings. It seemed a dark, superstitious and unwelcoming place. But then again, their view of the world has been formed by centuries of oppression. (And let’s not idealize the Mayan civilization… these villagers’ ancestors may have been the ones toiling away building pyramids and palaces for the Mayan elite.) On the other hand I don’t have much regard for outsiders coming into places proselytizing their new brand of religion either. Hey Bill! Good points all! I had definitely questioned the wisdom or grace of converting an indigenous person to another faith if that would result in the person losing everything material. And certainly the villagers’ ancestors were almost certainly peons, as were probably 99.5% of the Mayans. But that doesn’t change my feeling about them collectively, and I’m sticking with my view of “princes and princesses,” LOL. Saludos. There is an interesting back story about most of the town street vendors. They are Evangelical Christians who were evicted from their villages because of their conversion a generation ago. I had an interesting conversation with one of the young women who sold personalized pens. If I remember correctly, I wrote about her and her fellow vendors in my blog. The most memorable moment was when she said: “I’m 26. I’m single. And I’m free!” pumping her arms in the air like Rocky. Hola Steve! I read about those evictions in my Lonely Planet Guide. I didn’t realize that they had happened so far back, but the guide talks about how the people were evicted from their communities and came to settle in the outskirts of San Cristóbal in what came to be called the “belt of misery.” But I didn’t really get to talk to any of them. As you surely know, once they try to sell you something, they are the most persistent salespeople you will ever meet, and you literally have to nearly run from them to get them to stop. It’s hard to have a conversation under such circumstances, though I would have loved to. Thanks for the comment and Saludos! San Cristobal is a place I would live in a heartbeat except it gets extremely cold for some reason, most of the year! March, April and a bit of May are the warm months. Those wooly skirts and ponchos are definitely necessary the rest of the year. The Mayans in that area are a proud people. I met a Zapatista the last time I was there and sat and talked for hours. He got his Masters at Berkley in California in anthropology. Amazing conversation that I’ll some day share with you. To me the state of Chiapas is more like Guatemala then Mexico. Great place. Hola Barbara! It’s funny you mention the cold. I was chatting with the woman at the front desk of the hotel, and she was saying that in the mornings in January and February, there was snow on the trees in the mountains surrounding the city, but that it melted fairly early. I was amazed, but she said it was a pretty chilly place in the winter. Given the stone/concrete construction, I can imagine it’d be a chilly place to live. As for the Zapatistas, I’d really like to learn more. I remember reading about them in the 90’s, but I knew nothing then. Now that I’ve been there and seen the plight of the people living there, I am much more sympathetic. And I’ll hold you to some day telling me about your chat with the Zapatista. Saludos and thanks for the comment.